Would you like to learn more about Jim Crow and Civil Rights? Visit the Virginia History Explorer. Are you ready to be an image detective? Do you think we can learn about history just by looking at an old photograph? Search for clues in each photograph to see if you can determine the WHO, WHAT, WHEN, WHERE, WHY, and HOW for each image. Don't worry, there are questions for each image to help you discover all there is to know about these old photographs. Are you ready? What do you see in each photograph? Click on each image to enlarge it and see more detail. You may also click on the blue "i" in the corner of each image to read a description, or caption, of the photograph. Do you ever write descriptions about the photos you take? What information do you like to include? Some images will have more information in the caption than others. Why do you think this is? What do you think these men are doing? What makes you say that? Who are the men in this photograph? Can you recognize any of them? Look at the expressions on each of the three men's faces. What do you think they might have been thinking about as the picture was taken? Look at the people in the background of this image. Why do you think they've gathered here? 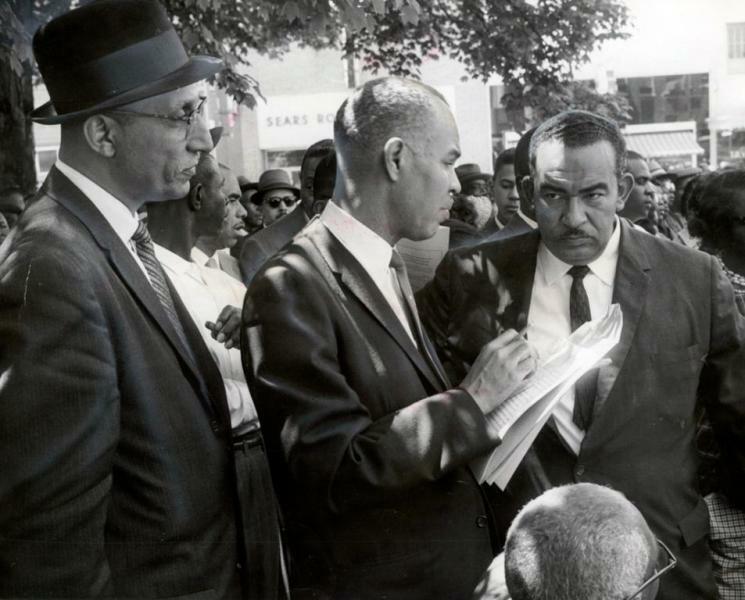 The man in the center is holding several papers. What do you think these papers might have on them? Who is the man you see bending over in this photograph? What do you think the girls in the seat are thinking? Why do you think that? How are the students dressed? Why do you think that? What do you think Dr. King is going to do next? Do you think the photograph was planned, or did this scene happen naturally? 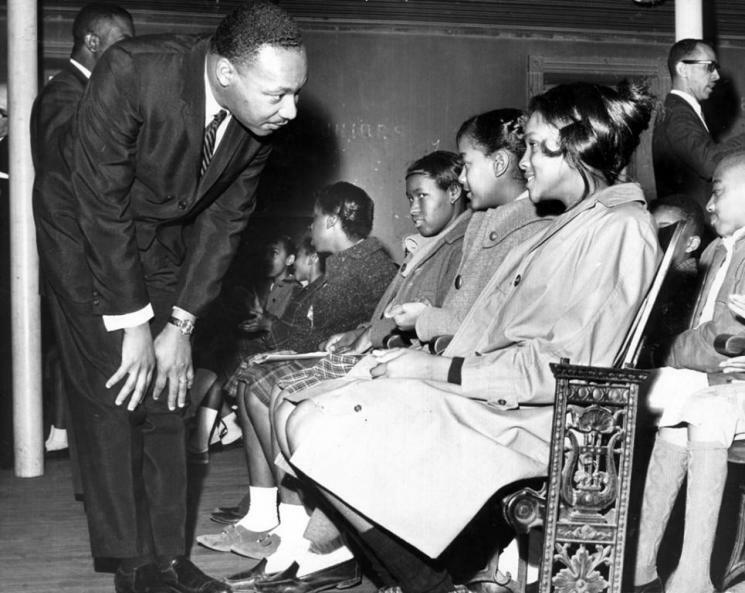 What might you want to say to Dr. King if you met him? What do you think is happening in this photograph? What makes you say that? Look at the man in the center, holding the sign. What do you think he is trying to do? The two policemen in the middle of the picture have been called to this scene. Who do you think asked them to come, and why? Look at the dogs in the photograph. Why do you think these dogs were brought along? Who is the most important person in the picture? What makes you say that? Imagine that you were participating in this protest. What do you think you would feel if you saw these policemen and their dogs? What seems familiar in this picture? Can you figure out what type of business these people are in? 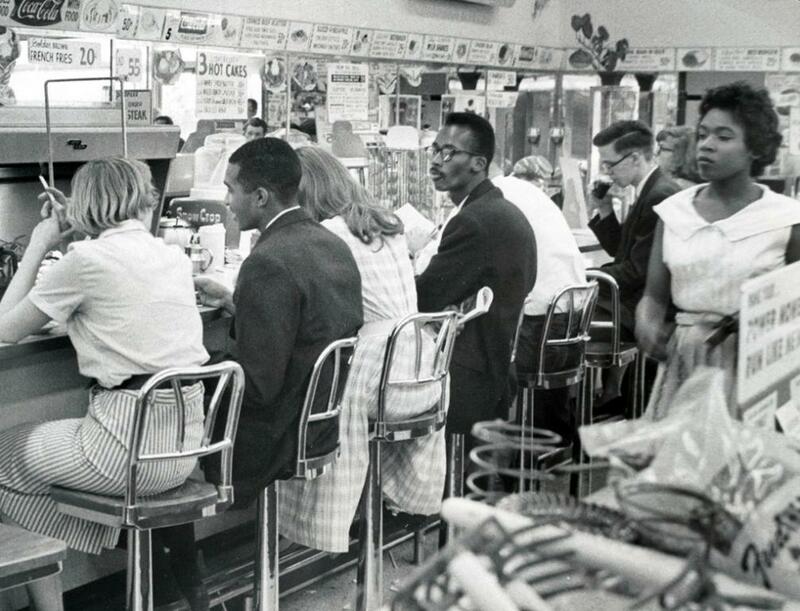 What do you think the people seated at the counter are doing? What makes you say that? What do you think happened right before the picture was taken? Write a caption for this picture that best explains what you think this picture is about. Pick two people in this photograph. What do you think they would be saying at the moment the photograph was taken? Why do you think the photographer took this picture? What makes you think something important is happening here? What do you think this woman is doing? What makes you say that? 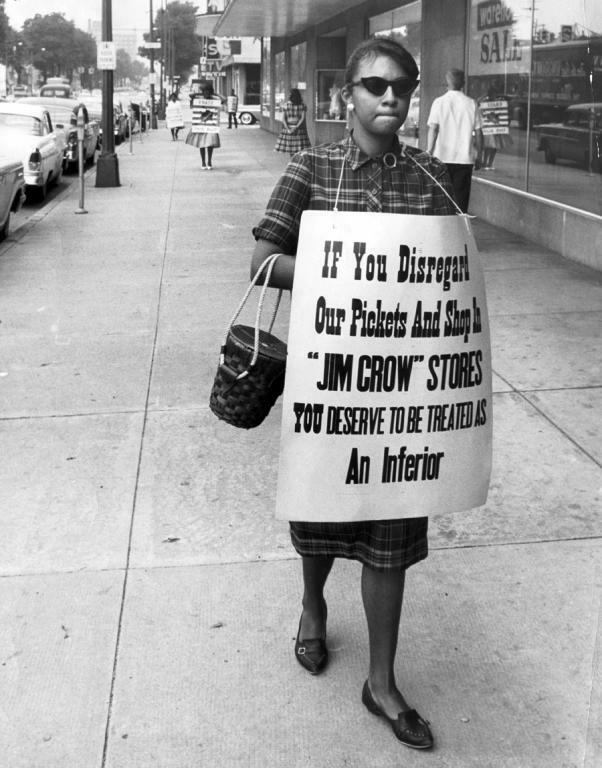 Look at the sign she is carrying. What does it say? What do you think she means? Look at the way this woman is dressed. Why do you think her clothes might be important? There are people walking in the background of this picture. What do you think a person passing by this woman might think? Look at the woman's face. Based on her expression, how do you think she feels? Why do you think the photographer took this picture? Look at these people. What do you think they are doing? 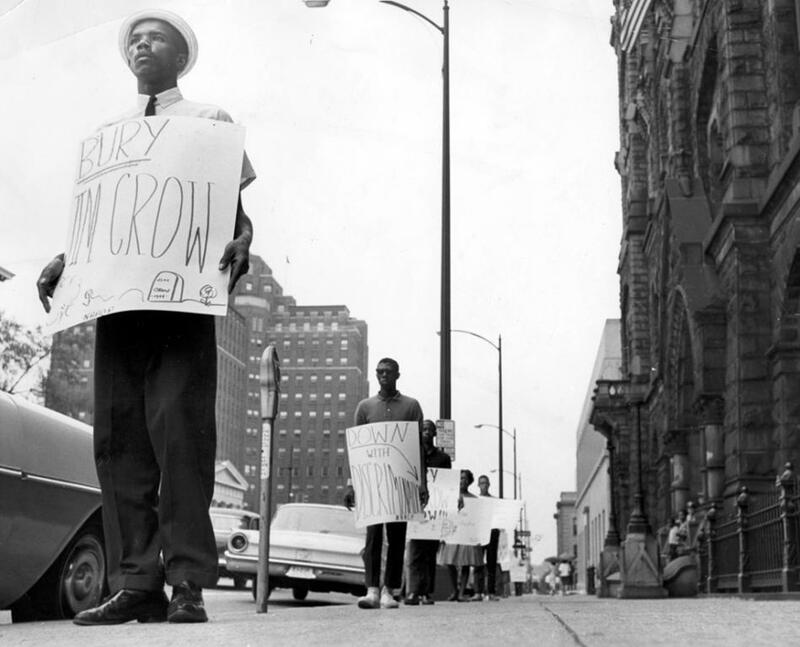 The first protester's sign reads, "Bury Jim Crow." What do you think this sign means? Can you guess the ages of these people? Do they look young or old? Why might that be important? The building that these people are in front of is Richmond's old City Hall. Why do you think the protesters chose this place for their demonstration? 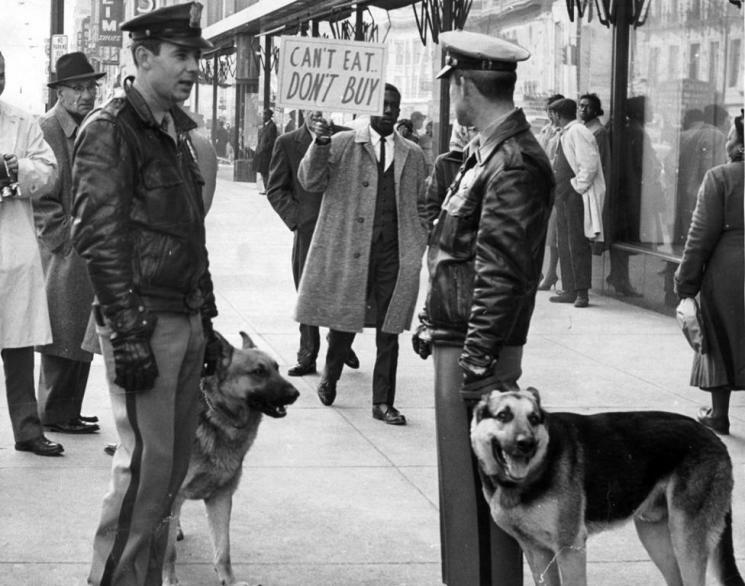 If you were standing on the street during this protest, what do think you would be hearing?